Written by Solidarity Halifax supporter Judy Haiven and member Larry Haiven. Both are professors in the Sobey School of Business, Saint Mary’s University. Originally published by The Chronicle Herald. The Nova Scotia government and its four acute health care unions have finally resolved their dispute over which unions represent which workers in collective bargaining. The British Columbia model of “bargaining associations,” floated by the unions last summer, and rejected by the government then, will now be the order of the day. Was this the big victory for the workers that some commentators claim? Certainly, the government showed an embarrassing ignorance of labour relations; it appeared overly ambitious and less than competent in re-drawing the map of bargaining. And it did back down. But recent events must be seen in light of bigger labour issues. Over the past 30-odd years, despite a few periods of economic woe, the average wealth of Nova Scotia (gross domestic product per capita) has increased by over 50 per cent. Despite hand-wringing by pundits and government commissions, we have become better off — roughly equal to New Zealand. Not too shabby. Problem is, the wealth hasn’t been shared. Over those same years of the province becoming richer, the average real (correcting for inflation) weekly income of Nova Scotian workers actually dropped. Unionized workers generally have not done better. The new wealth created has moved inexorably to wealthy holders of capital. That’s right, the people we’re now told should be paying lower taxes. The only workers successfully resisting the race to the bottom are those with a competitive skill set and valuable credentials: nurses, teachers, professors, and allied health professionals (like registered technologists and therapists). Not only do they have mobility, but withdrawing their labour, individually or collectively, is a palpable threat. And they are organized into professional societies, and into strong trade unions with whom employers must negotiate. Beyond pay, a range of professional issues, like autonomy, scope of practice and quality of service, spurs their militancy. Many are popular with the public. Teachers instruct our children. Nurses care for the ill. Crown attorneys prosecute criminals. Technologists administer radiation treatments to cancer patients. If they’re fed up enough to strike, public opinion is as likely to side with them as with the government. Not only do they resist recruitment to the government’s austerity agenda, their pushback encourages other workers to push back, too. That’s why the Nova Scotia Liberal government decided to put its very heavy hand on the scales of collective bargaining. First came Bill 37 a year ago, constraining the right to strike for a wide swath of public workers. Its “essential services” provisions are so strict that the act itself contemplates negotiations becoming meaningless. Whether the law will withstand the Supreme Court of Canada’s new muscular protection of collective bargaining and the right to strike is anyone’s guess. Next, with Bill 1 last fall, the government declared a war of annihilation on perceived Public Enemy No. 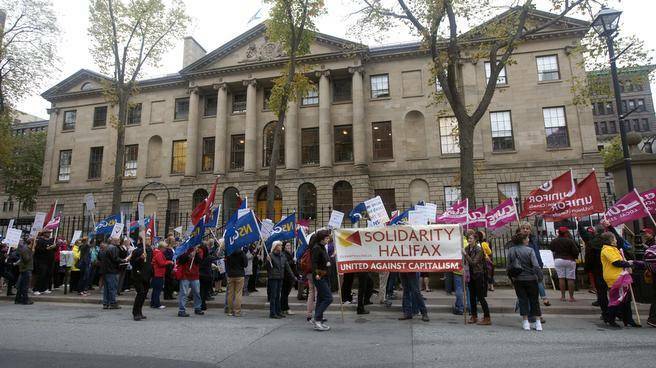 1, the Nova Scotia Government and General Employees Union (NSGEU). Too clever by half, the government drafted the law so a third party could only, in the words of mediator/arbitrator James Dorsey, act as “simply an usher showing everyone pre-assigned seating.” That Dorsey frustrated this Machiavellian project is a tribute to his experience and legal expertise but also to the government’s hubris. Faced with the exact opposite of what it intended, the government sensibly reached a deal with the unions. But the next act in this play will now commence. Later this year and next, government will preside over negotiations with big groups of public sector workers. Rather than taxing back some of the bounty reaped by capital, the government is eyeing savings from teachers, civil servants, and health-care workers. Will the groups of skilled workers with clout submit meekly, or will their anger and militancy redouble as the government attempts to balance the provincial budget on their backs?